Discussion in 'Headphone Amps (full-size)' started by burn1, Oct 18, 2014. After looking in the direction of tube headphone amps, contacted Dennis Had(former owner and founder of Cary Audio) a few weeks back. Found that he is building headphone amps in his retirement days. Never owning any tube audio gear before now, figured his Class A tube headphone amp would be a great first start. So I asked him to build me one. Dennis was responsive and kept me in the build loop along the way. Just received my unit the other day. The packing and shipping of his product is first class. Took me longer to remove the unit's protective bubble wrap and packing material than it was installing the tubes in the sockets. IHA-1 headphone amp w/ added DACT stepped attenuator and balanced input/output. Senn HD600's w/4pin XLR balanced cable set. Short term system upgrades will include CI Audio VDA-2 DAC w/upgraded power supply running via balanced cables. After initial amp power up and warm up, grabbed the first live recording CD I could find. Loaded Fleetwood Mac The Dance to see what the amp sounded like. Power aplenty and detailed would be an understatement. Musical bliss has been found in a headphone rig. Listening to the live track "Big Love", Lindsey Buckingham's guitar work sounds amazing. Enjoying various vocal, acoustical, and electronic recordings the last two evenings and all sounding just fantastic right out of the gate. I've made more than a few audio purchases over 30 years of buying equipment. Add the IHA-1 headphone amp to a short list of purchases that have contributed significantly to my audio listening enjoyment. It's my understanding the stepped pot used in this amp only has 24 steps. Do you have the 'now it's too soft, now it's too loud' problem? I am out of town and not with unit, but from recall. If no-volume on my unit is in the 5 o'clock position and too loud for me w/Senn HD's @ is 12 o'clock position. Find that I'm staying within the 9-11 o'clock position and there is a lot more throttle pedal left, if needed. Don't find any too soft/loud issues between steps. None for this listener. 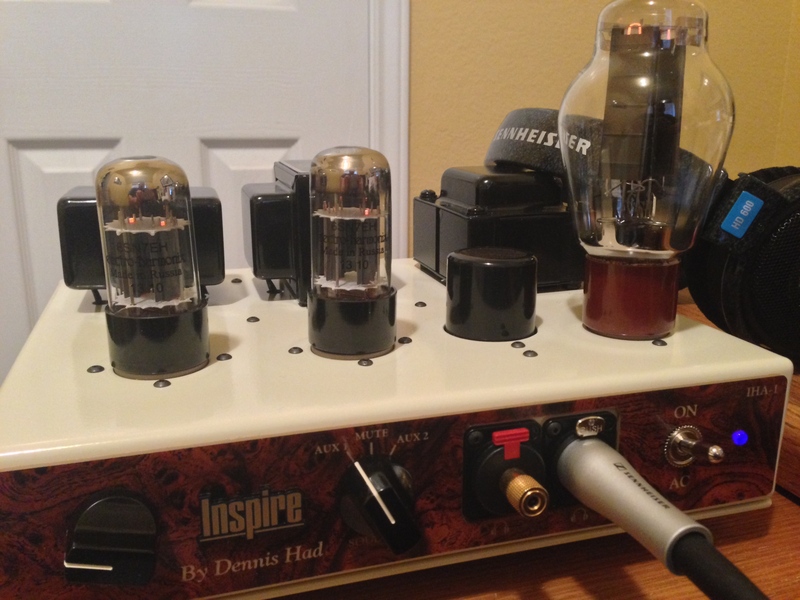 I posted my review over at http://www.head-fi.org/products/inspire-by-dennis-had-iha-1-dragon-version/reviews/11934 and there's been a lot of interesting discussion there and wanted to move it to a thread actually about an amp. Biggest discussion point thus far has been on the hum front, with several indications that either I'm the only one or that it does not happen with the 6BX7. I'm going to give the 6BX7 a spin tomorrow and see how that goes. I found it had the perfect number of steps for the LCD-3F and HD800s; I need to spend some more time with cans on other ends of various spectrums, but haven't had a problem where steps are too small or too large and haven't felt there was a problem getting too quiet or too loud. I tried this today. The initial turn-on hum is similar but it attenuates even further with the 6BX7. I'm also now pretty confident that the hum is predominantly (if not exclusively) in the right channel only. Something slightly different about where that channel is positioned versus the rest of the amp? Not sure. Is the hum at turn-on present for anybody else? If so, can you confirm if it's the right channel or both? Trying to figure out if this is just my example of the amp exhibiting this. With respect to the "hum", I thought I would add my findings. My comments below are about hum after the unit has been fully warmed up, not just initial start up. Using my T1's with my IHA-1 (mine is the upgraded "Dragon" version, sold exclusively by Moon Audio), there is no hum whatsover. Dead silence. Switching to my much more sensitive TH900's, when music is not playing, I can just barely hear a slight hum, present only in the right channel. When music is playing I don't hear the hum at all. "What your are describing is normal operation of the IHA-1. You may not have noticed the warm up hum more pronounced in the right channel. This is the 6SN7 (6BX7) tubes biasing up from a cold start. The process takes about 1 minute or less and settles in with the proper tube bias. Then you are off and running. Actually to my ears the amp starts to sound the best after oh, say 5 minutes of operation. Of course after a fews hours as most all tube amplifier your IHA-1 is truly singin!!! The other slight back ground hum in the right channel is down over 78 dB from music playing. It is more pronounced in the right channel because of the proximity of the right channel output transformer closeness to the power transformer. A bit of old transformer theory at work ... a slight electrical field picked up from the power transformer. I might mention on most tube headphone amplifiers without exception, at least the ones I am very familiar with use a resistor divider network in series with the output of the headphones. Yes this is effective in bringing the noise level down but and here is the catch and advantage of the Inspire ... the signal does receive corruption in these divider resistors. The hum you are hearing is so very low and you have excellent ears to pick up on the slight hum. Less sensitivity headphones wont ever have this hum but more sensitive might. Once again for fear of being repetitive ... all is running normal and you are listening to the purest form of vacuum tube amplification I know how to design." Using my TH900's with my Dragon IHA-1, this is the best/most enjoyable headphone sound I have ever experienced. I will post a review within the next several weeks. atubbs and smitty1110 like this. Once again for fear of being repetitive ... all is running normal and you are listening to the purest form of vacuum tube amplification I know how to design. What your are describing is normal operation of the IHA-1. You may not have noticed the warm up hum more pronounced in the right channel. This is the 6SN7 (6BX7) tubes biasing up from a cold start. The process takes about 1 minute or less and settles in with the proper tube bias. Then you are off and running. Actually to my ears the amp starts to sound the best after oh, say 5 minutes of operation. Of course after a fews hours as most all tube amplifier your IHA-1 is truly singin!!! The other slight back ground hum in the right channel is down over 78 dB from music playing. It is more pronounced in the right channel because of the proximity of the right channel output transformer closeness to the power transformer. A bit of old transformer theory at work ... a slight electrical field picked up from the power transformer. I might mention on most tube headphone amplifiers without exception, at least the ones I am very familiar with use a resistor divider network in series with the output of the headphones. Yes this is effective in bringing the noise level down but and here is the catch and advantage of the Inspire ... the signal does receive corruption in these divider resistors. The hum you are hearing is so very low and you have excellent ears to pick up on the slight hum. Less sensitivity headphones wont ever have this hum but more sensitive might. Ah, brilliant -- thank you for sharing that. Glad I'm not imagining things, but also agree with the sentiments entirely (incredibly enjoyable amp, on the verge of inaudible, etc). Will also add that I've received a very nice response from Dennis that echoed much of the above (won't repeat since it's mostly redundant). Love how much he cares about this "hobby." This amp is a treasure. Played with the EML 274b a bit today; need more time to form a real opinion, but gosh is that tube gorgeous-looking. Initial impressions are pretty positive, but not sure how I feel versus the Sophia 274b yet. Screams like a banshee when it's warming up! Really enjoy the EML 274b but it does have an interesting warm up noise (scream). It seemed to be very slightly smoother that the SE 274b. To be honest I have a lot of difficulty telling the difference in sound between rectifier tubes. My IHA-1 is slightly different from the Dragon model in that it has balanced and RCA inputs. Using the 6BX7 and balanced inputs I do not have any hum at all, at least not that I can detect. With 6SN7 I do have a very low hum between tracks. Very very low but it is there. I am using a Furman 2400 IT power conditioner so I am isolated from house power noise. I am listening to Audeze LCD 3f phones. Agree that the amp is amazing. Best buy I have made in terms of audio gear. There is a 3D aspect to the image that I have not encounter before in headphone amps. If you get a chance to listen to it downstream of a SLP05 do so with care. They sound even better together. Unfortunately, the SLP 05 has moved into the price of a small car territory. Maybe Dennis will start doing pre-amps. Some interesting DACs on this tread; Geek Pulse and NAD M51. Would be interesting to hear how they pair with the IHA. I like the NAD M51 pairing rather well; I've not yet made significant comparisons with other DACs upstream to this point. Regrettably have to agree on the rectifiers; I can't say that I can point out a difference between the Sophia and the EML when listening non-blind and I can't even reliably identify one tube or the other when listening blind. Love the aesthetics of the EML tube, but can't say I have any reason to suggest it's worth the premium over the Sophia. Probably need to go back to the stock Sovtek and re-check my work there as well.